Isabella's Project Diary: Easter Dress! I saw the lovely totally acetate cherry blossom brocade at Joanns back in February, I believe, and had to have it. I bought about five yards with the intent to make an Easter dress. 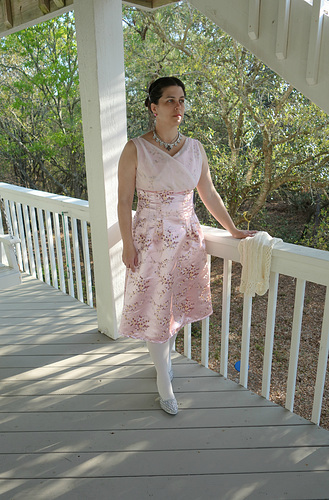 I finally decided on a style for said dress in late March and needed some pink organza (silk!) to match the brocade. I looked through my own patterns and realized a good dress pattern base is Simplicity 3673. I used style C - which is the wider skirt version of the pattern. I've used this pattern before but that was pre-weight loss. Luckily, the way the pattern is designed, it's only four pieces and very easy to trace the smaller size from the bigger one I cut out. The bodice, shown above, is what I changed the most. I cut the organza so it would be a cross over style by extending from the center fold over and keeping the armscye where it was. I also made the strap wider for the organza to get a bit of a gather at the shoulder. I cut the bodice under front out of the cherry blossom but also changed the neckline of it slightly so you just get a whisper of it from under the organza. In the picture, the blue line is mostly the original brocade front bodice pattern and the actual edge is what I used for the organza. Another change was with the skirt back. There is one picture of the skirt back in the pattern with only two darts and others with three. 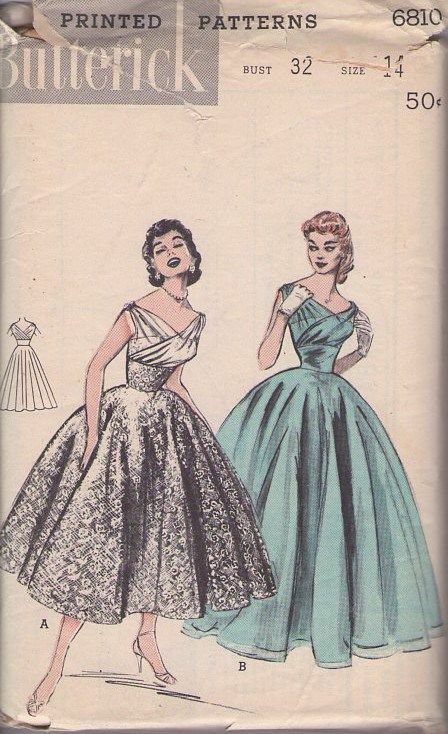 The pattern piece calls for three but with three darts on each side in the back, the skirt will not match up to the bodice back at the side seams. The bodice back isn't supposed to be gathered. So, to make it fit, I took out the middle of the three back darts and it works perfectly.